At Zinn Cycles, we specialize in building bikes and components for big guys. We know what works for big riders, so that means that our custom built mountain bike wheels will be the strongest available. We use the best rims, hubs, and spokes to create a stiff yet light and strong wheelset for any type of mountain bike. 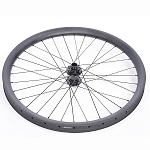 You can choose below for aluminum or carbon fiber 29 inch and 650b wheels. If you want something you don't see listed, email us at sales@zinncycles.com and we will be happy to accommodate any special requests.